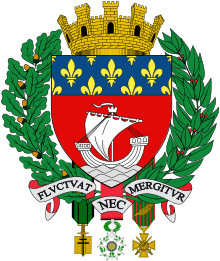 Usage notes: The Latin phrase Fluctuat nec mergitur has been a motto of the city of Paris since at least 1580, and the official motto since 1853. * In French, it may be translated as Elle est agitée par les vagues / battue par les flots, mais ne sombre pas: Paris may be tossed by the waves, but she will never sink; she is indestructible. Fluctuat nec mergitur feels particularly poignant after national tragedy. It’s used as a rallying cry for rebuilding and recovering and typically trends on Twitter.